The eighth annual USA Championships of ARDF took place May 8 - 10, 2008. 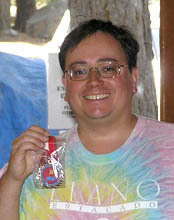 It was sponsored by the Texas ARDF group and the Houston Orienteering Club (HOC). The site was Bastrop State Park, about an hour's drive east of Austin. Unlike most of the Lone Star State, Bastrop Park is hilly and heavily wooded, with loblolly and other pines, making it ideal for radio-orienteering. The Houston Orienteering Club has done an excellent job of mapping it. On Thursday, participants fine-tuned their skills and aligned their direction-finding equipment using practice transmitters on both the 2m and 80m bands. An informational meeting with a drawing for the starting order followed. Friday brought the full-length 2m competition on the western side of the park, followed by an awards dinner that evening. On Saturday, there was an 80m event of similar difficulty on the eastern side, followed by presentation of medals. The competitive courses were open to anyone of any age, with or without an Amateur Radio license. This year's participants ranged in age from 12 to 66 and came from nine states, plus Canada. They braved snakes, spiders and poison ivy to track down the transmitters without injury. Packing gold medals in their suitcases for the trip home were Vadim Afonkin (M21 2m and 80m); Michael Bayern, W2CVZ (M19 2m and 80m); Jerry Boyd, WB8WFK (M50 2m); Bob Cooley, KF6VSE (M60 2m); Jay Hennigan, WB6RDV (M50 80m); Harley Leach, KI7XF (M60 80m); Nadia Scharlau (W35 2m and 80m) and Charles Scharlau, NZ0I (M40 2m and 80m). 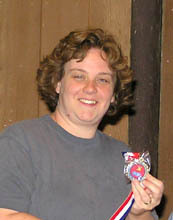 Organizing Co-Chairs for the 2008 USA Championships were Kenneth and Jennifer Harker, WM5R and W5JEN (pictured). They competed at the USA Championships in 2003, 2005, 2006 and 2007. Each won medals on both bands at the 2007 USA ARDF Championships. W5JEN qualified for ARDF Team USA in the W21 category at that event. WM5R was invited to serve on the international jury in Korea. Ken and Jen were organizers of the first Texas ARDF Championships in October 2005. The USA Championships concluded just in time for final selection of ARDF Team USA 2008 members, who traveled to the Gyeonggi province of South Korea for the 14th ARDF World Championships from September 2 through 7. USA's team positions were filled based on performances in these 2008 events in Texas and the 2007 national championships near South Lake Tahoe, California. Ken and Jen got high marks for organizing a successful championships, which included a catered lasagna feast on Friday night when the two-meter medals were presented. The 80-meter hunt on Saturday started early and the electronic scoring (provided by KE6HTS and the Los Angeles Orienteering Club) made it possible to award the medals and get the out-of-towners to the airport in time to be home for Mother's Day. Click here to see my photos from these championships and get links to other attendees' photos. Complete results of the competitions are now posted in the Texas ARDF Web site. These championships are also the subject of an ARDF Update feature on the ARRL Web site. Portions of this report have been excerpted from my Homing In column in the Fall 2008 issue of CQ-VHF Magazine. Report and photos copyright © 2008 Joseph D. Moell. All rights reserved. Go to Radio-Orienteering News for Southern California -- Results and stories of recent radio-orienteering events in southern California, plus announcements of upcoming ones.